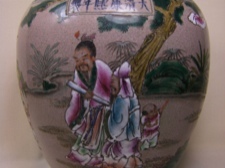 This 60 year old vase from China tells a colorful story portraying figures young and old in a garden setting. The background color is mauve with a crackle effect. 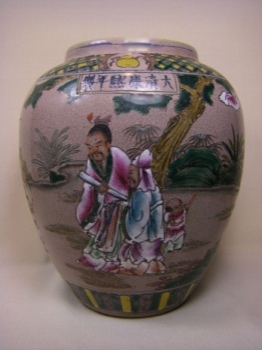 This unique vase is 10 inches tall and 8 inches wide. The opening at the top and the base measures 5 inches.